Collard greens are a southern cuisine favorite. The recipe is very simple and extremely easy to make. Here is how you can make southern collard greens with smoked turkey necks. This is sure to be a big hit with the family and at social gatherings. Read more for more information. Add some water to the large pot. Fill it to the halfway point. Put the turkey necks in the waters. Allow the water to come to a vigorous boil. The smoked turkey necks should be allowed to cook for an hour. You want the meat to fall off the bone. This step is important. The turkey has to be tender enough to come off the bone. Cook it as much as you have to in order to achieve this. This is the flavor for the batch of collard greens. Rinse the collard greens with cold running water. Tear them into pieces. Be careful to remove all the grime and grit from the leaves. If you do not rinse the leaves well, you will be able to taste the dirt in the final product. Place several pieces on top of one another and make a roll out of the collard greens. Put the roll of collard greens on the cutting board. Cut the greens into strips with a large, sharp knife. When you make a roll, it makes it easy and quick to cut and handle. So, you can roll as many collard green leaves together as you can cut with your knife. Put your collards in the pot with the smoked turkey neck and water. Fill the pot up. Don’t worry, as the collards cook the leaves will wilt. You can add the remaining greens once there is more room in the pot. Do this until there are no greens remaining. Add the other seasoning to the greens. The garlic powder, black pepper and salt enhance the flavor of the dish. The greens need to cook over medium heat for 30 minutes. Stir your greens and smoked turkey together so that the meat id distributed evenly throughout the pot. Put portion of the greens from the pot to the crock pot. After the crock pot is full, boil the water. Turn the heat all the way down to low. Allow the greens to cook for up to ten hours. 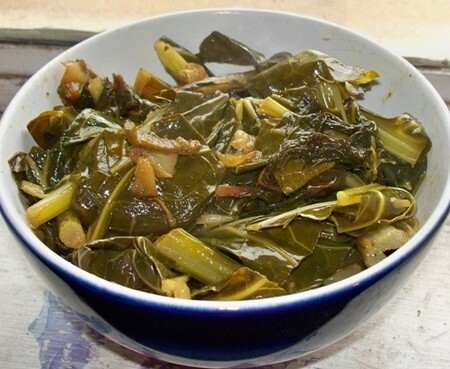 Enjoy your collard greens made with smoked turkey necks.